October 1 is an important deadline for SIMPLE IRAs and Safe Harbor 401(k) plans alike as it happens to be the last day of the year these plans may be established for the calendar year. 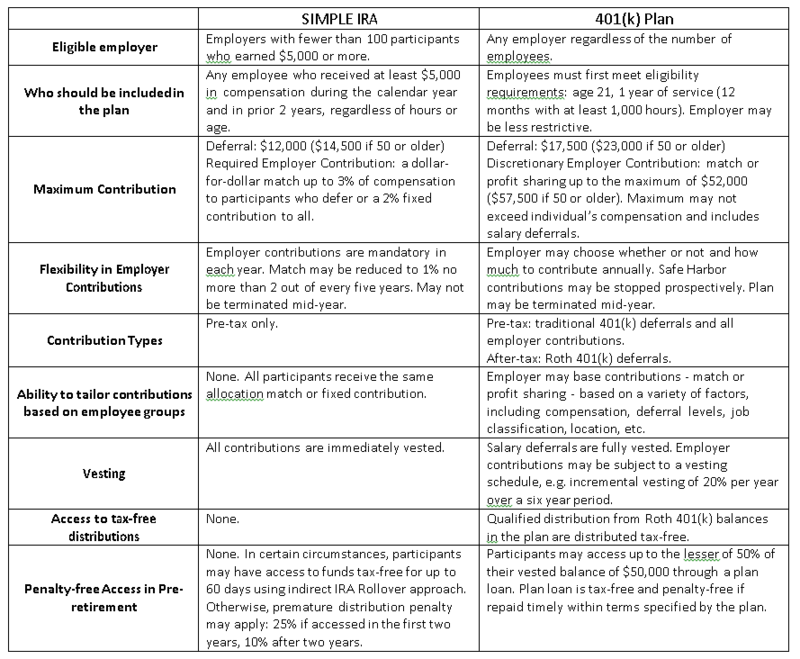 By November 2, sponsors of SIMPLE IRA plans need to communicate to their employees company intentions for the plan in the upcoming year; this communication is accomplished through a mandatory Annual Participant Notice. With that, it’s important to evaluate which plan is the best fit in the current year and beyond. Bottom line: While SIMPLEs and SEPs offer a streamlined set-up, low maintenance, and minimum annual fees, the lost tax savings opportunity is very costly, $18,249(SEP) and $11,819 (SIMPLE) in the above examples, even after the administration costs associated with a 401(K) plan are taken in consideration. In addition, 401(k) plan option offers greater flexibility, tax-diversification options (ability to accumulate and later access assets on a tax-free and tax deferred basis), better manage employee benefit costs, and offer more robust asset protection. 4. Investment Platform: review current platform for fees and services or help identify best options for a new plan.